The Bay Islands of Honduras (Islas de la Bahia), first sighted by Christopher Columbus in 1512, are located in the Caribbean Sea, and are made up of Roatan (the largest island - located off of the Northern coast of Central America/Honduras), Utila, as well as many other smaller islets. 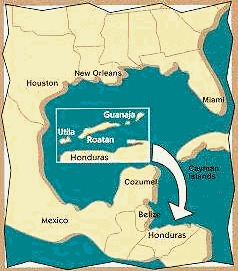 Roatan is roughly 35 miles long, while Utila is about 7 miles long. The Bay Islands are located in the Central Standard Time (CST) zone, and do not recognize daylight savings time. The local language of the Bay Islands is Spanish, however you will find that English is widely spoken. The islands are like tiny jungles, covering outcroppings of an underwater mountain range called the Sierra de Omoa. Find yourself relaxing in the warm trade winds while you sway in a hammock hanging from the beautiful palm trees. Make your way into the turquoise blue waters and experience a part of the world's second largest barrier reef system. Enjoy diving in an abundance of stoney corals, vibrant sponges, a plentitude of colorful fish, wrecks, amazing wall diving and exciting swim-throughs. If you are really lucky, you may even have an encounter with a whale shark or a dolphin! The Bay Islands are tempered by tradewinds that create a tropical climate with average air temperatures around 80 F and a relative humidity of 80 percent. Average water temperatures range from 78F to 80F, and water visibility ranges between 75 to 150 feet, with reduced visibility during the rainy season (October through January). The best months for diving the Bay Islands are February to June. The climate is generally pleasant without extremes in temperatures. Lightweight clothing is suitable all year round. When traveling to the Bay Islands, you will fly into San Pedro Sula, Honduras and catch a connecting flight to either the Roatan International Airport or Utila. Some airlines do fly direct to Roatan. The Bay Islands are serviced by the following airlines from various major cities around the world: TACA, United and Delta. The best connecting cities for flights to Roatan from the mainland US are from Altanta, Miami and Houston on the weekends. From the Honduras mainland you also catch inexpensive ferries to Roatan or Utila. Taxis are available at the airport and most resorts, and generally have no meters, so negotiate prior to getting into the car. In the alternative, you may choose to rent a car while in the Bay Islands. When traveling by car in the Bay Islands, you will drive on the right hand side of the road. To rent a car, a valid national or international (English Language) driver's license is needed. If the driver's license is not in the English language, the visitor must carry a translation with the license. Some rental companies also have a minimum driver age of 21. When entering/exiting the Bay Islands, proof of citizenship is required (i.e. valid Passport) along with a return ticket. A valid passport with at least 6 months past the date of your return is required to enter the country. For more information and any updates on these new regulations visit http://travel.state.gov/travel/cbpmc/cbpmc_2223.html. There is a $39.00 (US) departure tax for the Bay Islands that is paid at time of departure. This amount must be paid in cash! The Bay Island's local currency is the Lempiras. There is no need to exchange US dollars for Cayman currency, as they are widely accepted throughout the islands. Travelers checks are not accepted in most establishments throughout the Bay Islands. The most commonly accepted credit cards are American Express, Diners Club, MasterCard, Visa and their affiliates. Automatic Teller Machines (ATM) accepting VISA and MasterCard can be found at the airport and in the resorts. There is a $39.00 (US) departure tax for the Bay Islands that is paid at time of departure. The Bay Islands have a modern telephone system which enables you to make local calls, long distance within the Bay Islands, and International Direct Dialing (IDD). The Country code for the Bay Islands is (504). The electrical current in the Bay Islands is 110 volts, 60 cycles AC and compatible with American appliances. There are no suggested inoculations needed to enter the Bay Islands, however when traveling from an area know to be infected with Yellow Fever or Cholera, a vaccination certificate is required for travelers over 1 year of age. For more information on traveling abroad, and possible health risks, contact the Center for Disease Control in the US. When visiting Roatan or Utila bring a good insect repellant (DEET or AVON Skin So Soft), as well as clothing to cover arms and legs. Roatan has several clinics available for your safety; Woods Medical facility is the newest and most modern. There are several decompression chambers throughout the island of Roatan. There are larger medical centers/hospitals available in San Pedro Sula and La Ceiba on the mainland of Honduras. Most shops in the Bay Islands are open Mon. - Sat. 9:00 a.m. - 5:00 p.m.